By now, most of you are familiar with the crazy baby-care instructions that I left my poor (forgiving) in-laws the first time they came to care for our (then) 1 year old daughter. That post outlined what I imagine was going through their heads as they read my insanely detailed (6 page) note. This post once again involves my in-laws, but mostly involves me and some poor, confused shop owner in Weatherford, Texas. It outlines what I know was going through my head as I had a lengthy (about 2 hour) text conversation with someone I thought was my father-in-law. It all started innocently enough. My husband’s parents were coming for a visit and stopped in Weatherford, Texas on their drive from Arizona to Austin. That’s when the confusion began….when I received this text from my father-in-law (or so I thought). Okay, nothing out of the ordinary so far. 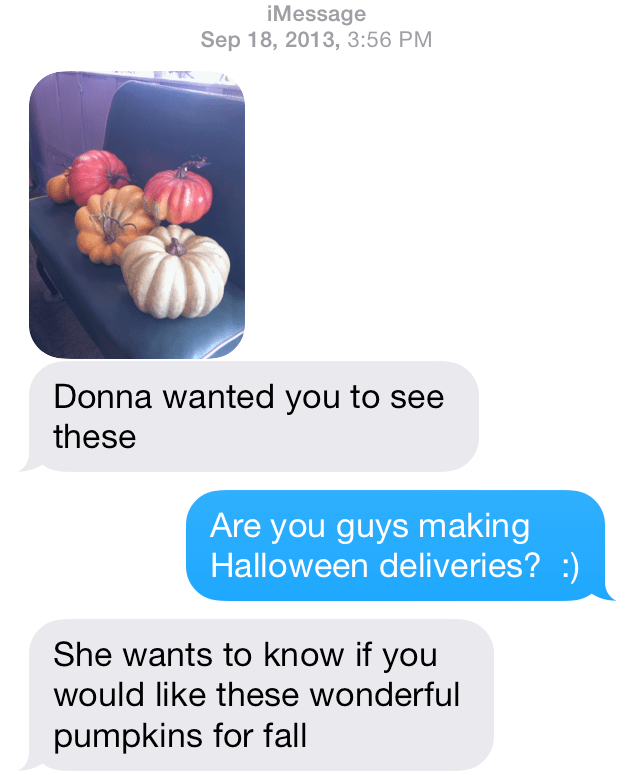 My MIL is incredibly thoughtful and I can see her seeing these and wanting to buy them them for us…..and I can also see my FIL throwing in a sarcastic ‘wonderful‘ after being asked to text us a picture of some pumpkins on a school bus seat. 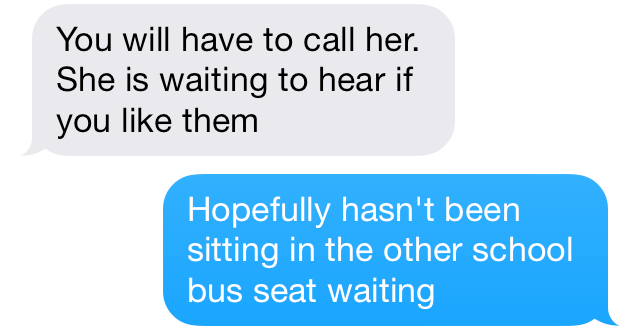 Oh dear…he’s referring to her as “my mother in law”. 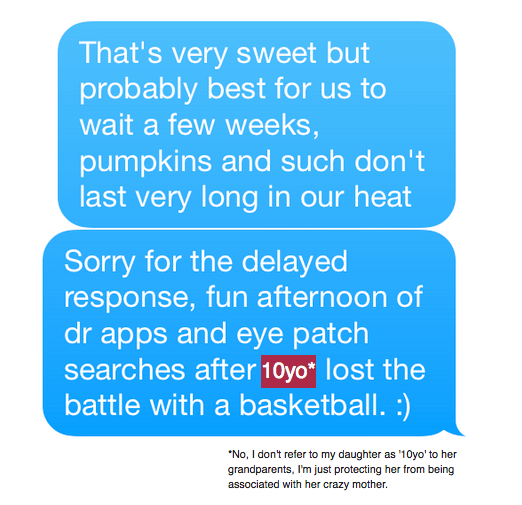 It must be because I didn’t reply to this text for over an hour while I was at the doctor’s office for yet another one of my daughter’s crazy injuries. 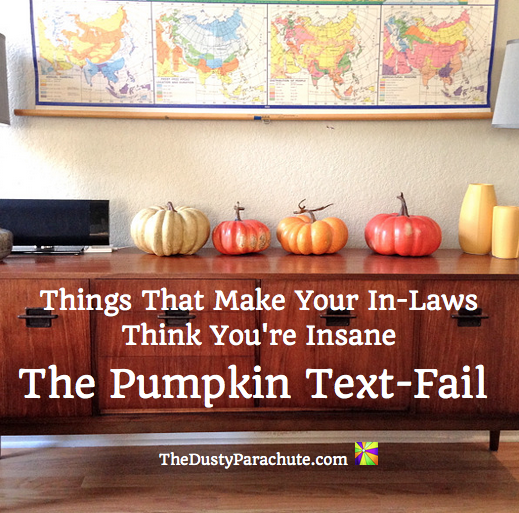 Well, those ARE wonderful artificial pumpkins because I totally thought they were real. And my father in law is either in a very silly mood or had a couple drinks with lunch...”I only deal in top quality items”????? Ha Ha Ha….Get it….because the pumpkins were sitting on a school bus seat???? Haaa….. Okay, now things are getting a little weird. My FIL is supportive and all, but usually not in a texting kind of way. Not sure of her number? Okay, without Siri’s help I don’t know my husband’s number either, but aren’t you kinda standing next to her right now? And why did I have to call her when I’m texting you? Are you guys not speaking to each other? Did you abandon her on the pumpkin school bus? My apologies to that poor, confused shop owner. And if you’re ever in Weatherford, TX…the pumpkins really are wonderful. Well in your defense HE started it by texting the wrong number! Haha! Great story. Ha ha! I was cracking up all the way through. I just know something like this is going to happen to me someday! Hilarious! And they are indeed beautiful pumpkins! Art was on the other end! The pumpkins still look good!